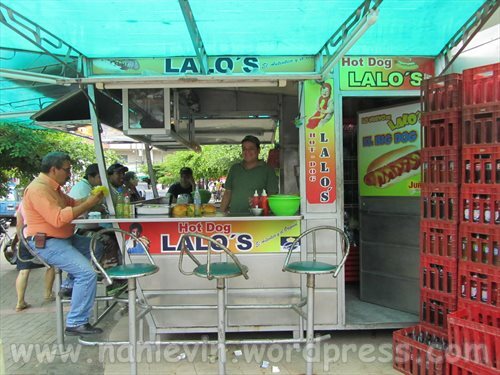 When we go into centro Portoviejo we always try to stop and get a hot dog or hamburger at Lalo’s. This is a very small kiosk at one corner of the Super Exito shopping building. It is small, it is a tight fit on the tiny stools, not much counter space, it is always crowded with locals catching a quick bite on the run. BUT IT IS GREAT! Again yesterday we stopped, what a treat. I normally have the hamburger but have never been able to finish it so yesterday I ordered the hot dog. That is what the gentlemen is making in the above picture. 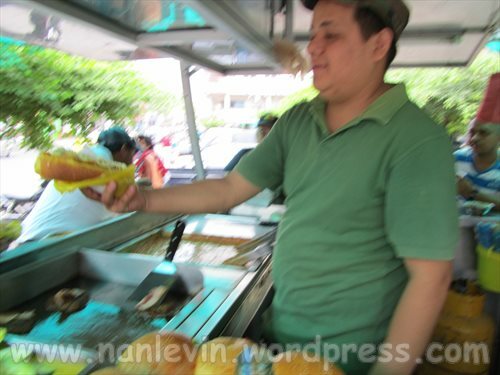 It is a Juris foot long hot dog, that has been simmered in a most excellent sauce made with white onions, ketchup, mustard and of all things Tampico orange drink. This is piled high in an egg hot dog roll and topped with a mayonnaise sauce and grated fresh cheese. Okay, I ate most of it before I took the picture, but this shows just what is in each bun. 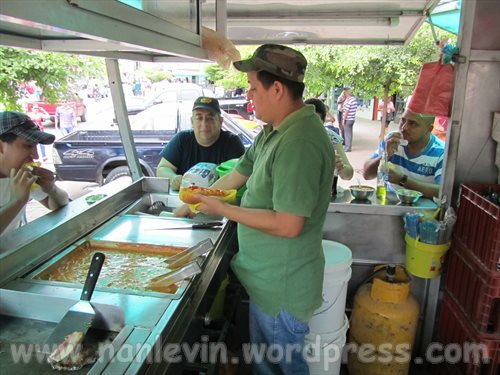 Lalo’s is a favorite when we are running around Portoviejo. If you get a chance to stop in do try the hot dogs Joe and I both highly recommend them. And the young man who runs the place is fast and seems to enjoy his work. Oh yes, a lot of joy for $1.50. 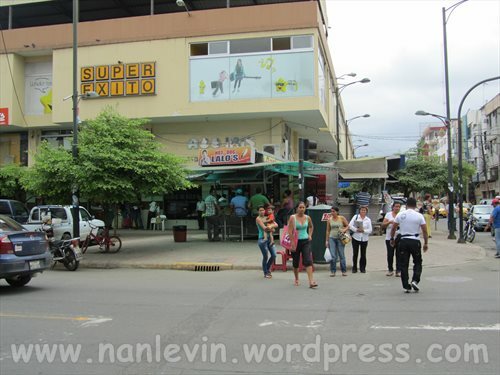 This entry was posted in Ecuador, Hamburgers, Hot Dogs, Manabi, Portoviejo Manabi, Shopping and tagged Beach living, Carts and Kiosks, Cooking, Ecuador, food, Hot dog, Portoviejo, South American by Nancy Levin. Bookmark the permalink. sounds good, will have to look for that place next week maybe!! 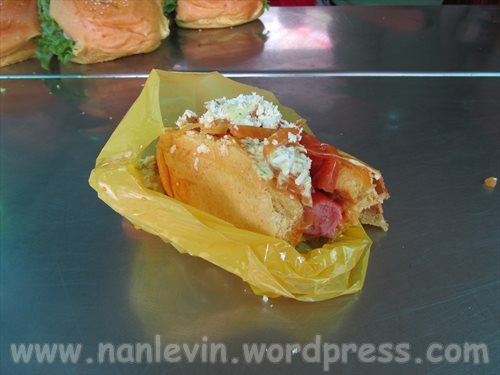 Here in David Panama I go to Price Smart and have a hot dog for $1.34. Yours looks better than mine plus I love having meals at outdoor places.